White House Science Fair Stars: Where Are They Now? A new star could be born at the White House Science Fair on Tuesday, where, since 2010, young inventors have gone from being "A" students to full-on professional scientists and engineers. This year, kids are doing everything from searching for a cure for cancer to launching advanced rockets into the sky. The White House is putting special emphasis on celebrating girls who excel in math and science. Here are a few kids who kept doing cool things after their big White House Science Fair debut, and what they're up to now. T.J. Evarts: From SmartWheel to "Shark Tank"
At the very first White House Science Fair in 2010, President Obama gave the SmartWheel a spin: an add-on for steering wheels that can detect distracted driving. The leader of the team that created it, T.J. Evarts, has continued developing the device while working on other projects in engineering and robotics. An appearance on "Shark Tank" netted the team a $100,000 investment, and they were finally granted the patent for the SmartWheel in October of 2013. He's now CEO of his own company, started with his friends: Inventioneers Etc. 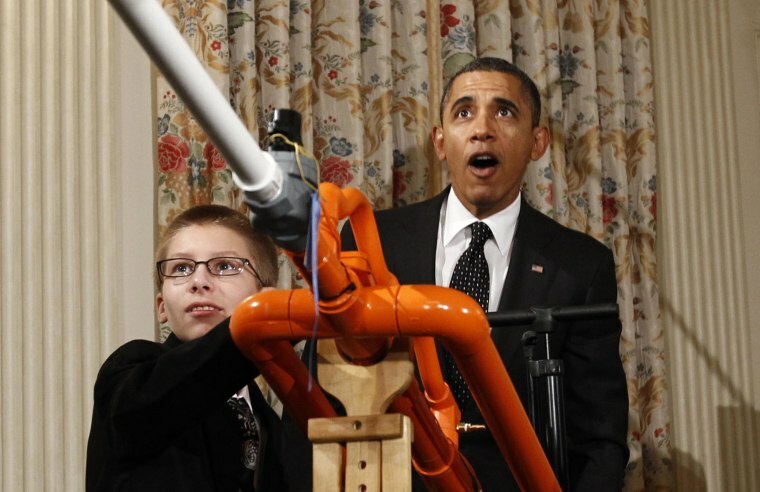 In 2012, Joey Hudy became one of the most famous science fair participants ever when Obama launched a marshmallow across the State Dining Room with his air cannon. In December, the 16-year-old became the youngest person to join Intel through its corporate internship program — something normally reserved for college students. Since then, he has built his own Twitter following and even represented Intel at the 2014 Maker Faire in California. He even scored an invite to the president's 2014 State of the Union speech — a rare honor. Taylor Wilson, who at 14 became the youngest person ever to achieve nuclear fusion, is still splitting atoms. His website lists multiple projects that sound more like DARPA-funded initiatives than inventions of a teenage physicist. He's working on new ways to detect highly enriched uranium and weapons-grade plutonium, and he hopes to improve positron emission tomography, a medical imaging technique — ideas he's shared in not one, but two TED Talks. In his spare time, he massively irradiates common materials just to see what happens. Hey, everybody needs a hobby! Watch out, Bill Nye the Science Guy. Since impressing Obama in 2013 with her painting robot, Sylvia Todd has been gaining steam as an Internet celebrity. Her YouTube channel, "Sylvia's Super-Awesome Maker Show," teaches kids how to make cool stuff and regularly get tens of thousands of views. She spoke at a TEDx conference, as well as the United Nations in Geneva, Switzerland, for International Girls in Information and Communication Technology Day. The most impressive part? She is only 12 years old.